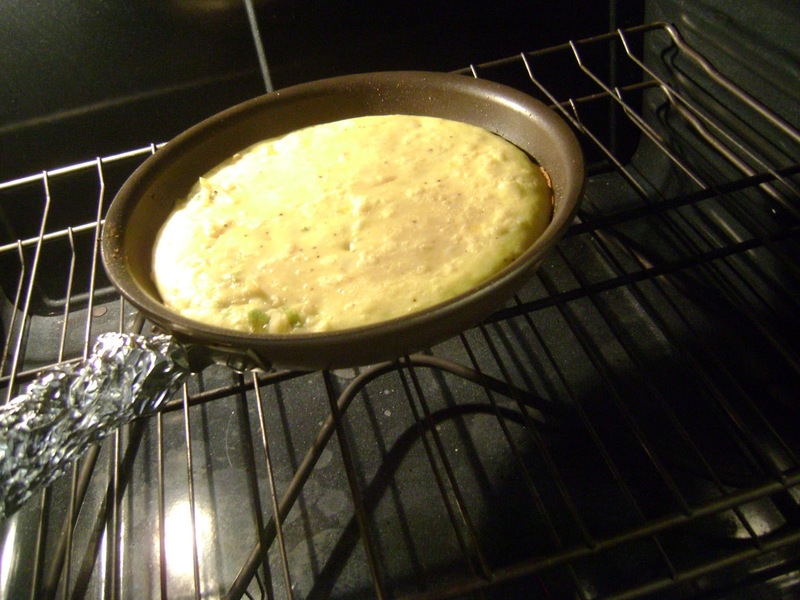 Frittata is an egg-based dish similar to an omelette or quiche. This versatile frittata recipe can be made for breakfast, lunch or dinner, or makes a great snack. It can be served warm or room temperature. It's made with leeks, a vegetable with a flavor similar to onion, but much milder. 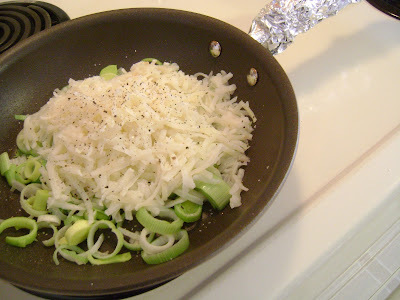 If you don't have or don't want to use leeks, you could substitute chopped onion. If you do use leeks, be sure to use the white and light green part only, slice it, and give it a good rinse in a bowl of cool water to loosen any sand that may be hiding between the layers. 1. Spray a 10 inch non stick pan with cooking spray and heat on med. Add leeks and potatoes. Season with salt and pepper. Saute about 5 - 7 minutes to soften leeks and warm potatoes, stirring frequently. ( if you notice the mixture starting to brown too much, add a bit of water to finish saute). 2. If handle of skillet is not ovenproof, wrap in aluminum foil. Preheat oven to 425 degrees F.
3. In a med bowl, mix eggs and ricotta cheese. Add salt and pepper as desired to egg mixture. 5. Invert frittata onto a platter and cut into 6 wedges. Serve warm or at room temperature. Great idea to put in fat free ricotta!! I bet this was DELICIOUS!!!! Frittatas are SOOOO good!!! Have a great week! I am on an egg kick right now and I love the idea of eggs + ricotta! This would make a perfect "brinner". Book mark ;) And thank you for your sweet comment on my blog! That looks delish. I just started the points plus last week and I go in for my first weigh in tonight. EEK. Can't wait to try this with my roommate. We are doing points plus together. Thanks! YUM YUM YUM! I need to try this recipe out.